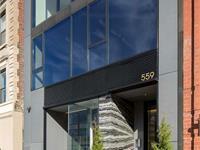 at 559 West 23rd Street, New York. The development was completed in 2016. 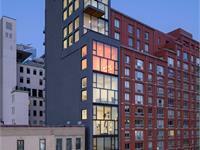 559w23 has a total of 6 units. 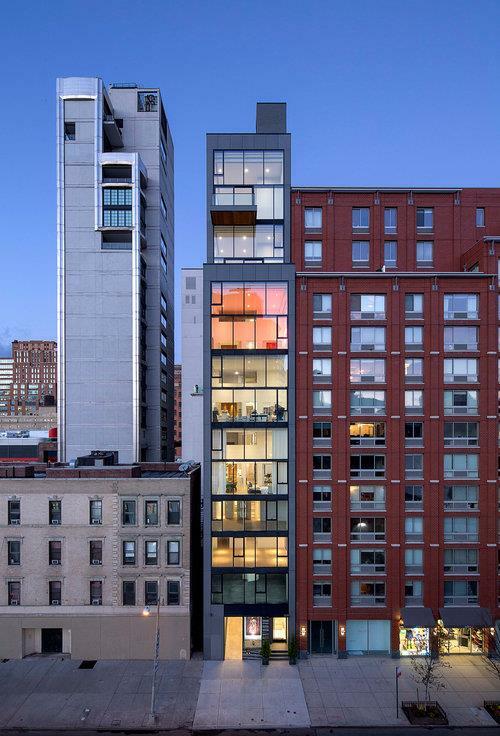 SIX EXTRAORDINARY RESIDENCES at 559 WEST 23RD STREET. 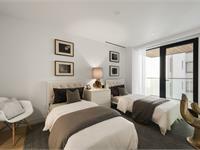 Conceived with views, light, and drama, these 3-4 bedroom urban sanctuaries are all uniquely designed with luxurious features: soaring double-height ceiling and generous terrace spaces. 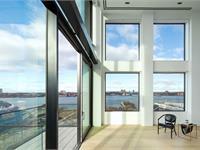 The Great Room, which is endowed with 17.5-foot ceilings and French oak floors, is washed with daylight from a full-height, floor-to-ceiling glass wall. With the adjoining Kitchen and Study, the Great Room provides more than six hundred square feet of integrated living space with stunning Manhattan and Hudson River views. The Great Room is simultaneously the heart of the home, the crossroads of daily living and the unit’s most unforgettable feature. Kitchens, which deploy top European components throughout, are designed to integrate seamlessly with adjoining spaces such that food preparation is inseparable from the living and dining rituals of the home. Kitchens are framed by custom, German-made cabinetry from Eggersmann that are finished in walnut and lacquer. Countertops and walls are hand crafted from honed Montclair Danby marble. 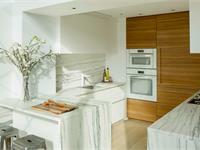 Appliances, including double ovens, gas cooktops, hood ventilation and dishwashers are by Miele. Refrigeration and wine coolers by Sub Zero. Sinks are stainless steel and faucets are Italian-crafted by Fantini. 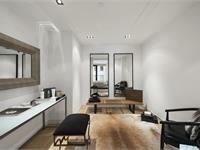 The Master Bath was conceived as a personalized Spa. 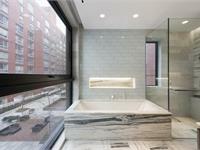 Contemporary European hardware is paired with Montclair Danby marble and large-format Italian glass tile throughout. Faucets by Fantini are deployed for Shower and Bath. A wall-hung toilet and marble-ensconced bathtub are sculpted by Duravit. 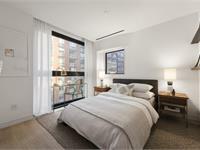 North and east-facing windows provide morning light and present stunning views of the Manhattan skyline. A custom-made wood vanity with mirror cabinet provides a measure of warmth to the otherwise cool pallete of stone, glass and tile. 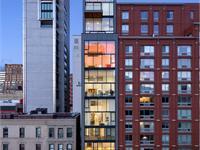 The two Penthouse Units were conceived as three-bedroom, two-bath ‘Sky Lofts’. 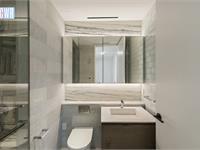 Bed and bathrooms are set to the rear so that the remaining floor space - roughly half - is endowed with staggering 19-foot ceilings, floor-to-ceiling glass, French-oak floors and spectacular Manhattan and Hudson River views. Living, dining, cooking and entertaining areas easily co-mingle in this cavernous space, which spills outside onto a private terrace. 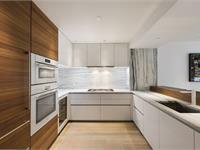 Kitchens deploy custom cabinetry by Eggersmann, Miele appliances and fixtures by Fantini. Refrigeration and Wine Storage by Sub Zero. Countertops and walls in Montclair Danby marble. 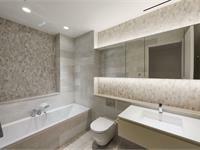 Penthouse bathrooms are outfitted with wall-hung toilets and bathtubs by Duravit and faucets by Fantini and Hansgrohe. 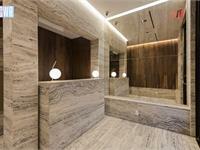 Walls and floors are composed of Montclair Danby marble, large-format, Italian glass tile and quartzite stone tile. 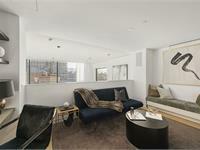 Duplex Unit 3-4 enjoys exclusive use of a seven hundred square foot (700 sf) exterior terrace at the rear of the building. This ‘outdoor room’, which is enclosed on three sides by quartzite-clad stone walls, was conceived as a three-season courtyard for dining and entertaining. 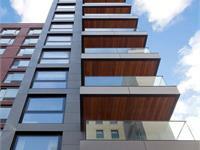 It expands the interior dining and entertaining footprint more than three-fold. Open the glass sliding doors from the Dining Room, and the result is almost one thousand square feet (1,000 sf) of continuous entertainment space from kitchen to garden. On less formal occasions, the Terrace serves more modestly as ‘back yard’, offering a coveted, personalized outdoor room that is an integral part of the home. 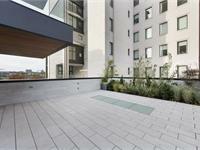 A built-in planter at the north wall can accommodate mature trees, and the reinforced concrete terrace was built to support almost any manner of green roof or garden envisioned by the residents. A walkable glass skylight (daylighting the Gallery below) punctuates the ground with striking crystal, recalling a fountain at the heart of a traditional garden. 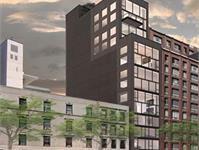 Your inquiry will be delivered to the 559w23 sales team, who will send you more information about this development.